In today’s B2B PR, good analyst relations (AR) are essential. Technology analysts at firms like Gartner, Forrester and IDC can meaningfully shape the overall direction of a category and directly impact a B2B technology provider’s business. This can occur in two ways. First, most analyst firms publish in-depth research that potential clients and existing customers buy on an ongoing basis. These reports are meant to guide technology decision makers on the best vendors, or at least the most relevant ones. The most famous examples are Gartner’s Magic Quadrants and the Forrester Wave. Companies pay tens of thousands of dollars a year to have access to analyst reports, so vendors that are well positioned in the the reports benefit. The second way analysts affect a category or industry is more informal. Analysts are constantly being tapped as thought leaders by media for stories, as expert panelists and speakers by event coordinators, and more. They have a platform to share their opinions and perspectives on who matters in a space. This is why AR, and building bonds with relevant analysts, can help a business stay top-of-mind and be referenced. A mention by an analyst confers immediate third-party credibility for a solution by someone with real authority in the industry. But how do B2B tech companies build long-term relationships with industry analysts? Many have paid relationships, of course. Any analyst company is more likely to listen to a client company, especially one in a hot category. But it is possible to get their attention without paying an analyst company? Ultimately, it all starts with an analyst meeting, and in maximizing the opportunity once secured. I’ve sat in on hundreds of analyst meetings over the last seven years. Here’s what I recommend. Every analyst meeting, unless otherwise directed, should start with a cogent presentation that outlines a company’s mission statement, positioning and differentiators, core features, pricing, clients, use cases, and scale. These presentations should be more in-depth than a typical media overview, of course, given analysts’ level of expertise. And they should be less focused on marketing jargon — analysts can see right through that — and more focused on the technology. The overview should last roughly 10-15 minutes. After B2B tech companies offer up an overview of their platform, it’s important to walk through and demo it. Again, this demo differs from a media demo, which is generally very top-level, if provided at all. Instead, an analyst demo should be more comprehensive and in the weeds, calling out any bells and whistles competitors don’t have. The demo should be the centerpiece of the briefing and take up the majority of the time. Given its importance, it’s critical to bring a top demo provider. If this means passing the baton from a CEO or C-suite exec to a product manager, then so be it. Whoever will deliver the best experience should be the demo point person. Analyst meetings are an excellent opportunity for a software company to gather valuable feedback on company positioning, products and features, pricing, and more. Too many B2B technology companies will treat an analyst briefing as an opportunity to steamroll an analyst with an information dump. I find that the best meetings, however, are more conversational. Pausing to ask an analyst for their opinion on something leads to a more engaging dialogue, and will likely elicit candid insights and feedback that can shape your market strategy. This takes on even more importance if you’re not a paying Gartner or Forrester customer, since you have limited access to the analysts. Just as an analyst can share their opinions on your company’s positioning, a rising business can set itself up as a valuable information resource for the analyst. Don’t be afraid to share insights into current or future industry trends relevant to the analyst’s coverage. They appreciate an informed perspective from the front lines on the space and competitive landscape. This will show that you care about the demands of their job – and that your company is a thought leader. If you can become a reliable resource, your company and solution will resonate that much more with the analyst moving forward. 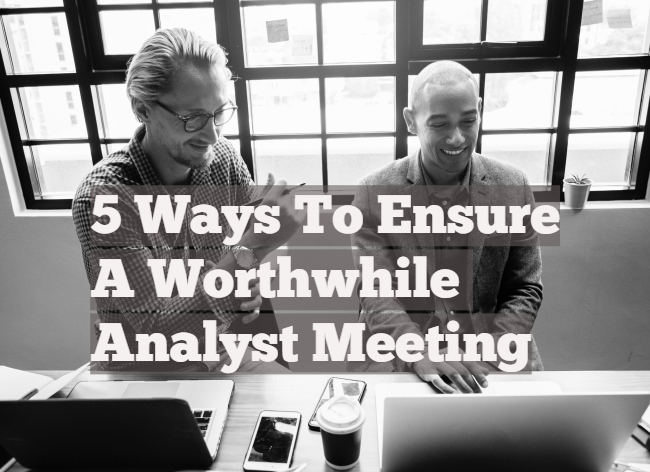 Once a meeting has wrapped, PR teams should incorporate the analyst into their outreach plans. This means pinging them about significant platform updates, new product launches, customer wins, and more. This will allow a constant drumbeat and ongoing communications between formal briefings or meetings. (As with media, outreach must be tailored and personalized.) A failure to nurture these relationships can result in your outstanding solution not getting the visibility and market share it deserves. AR is a key piece of any B2B technology PR or marketing program. Cultivating relationships with analysts can move the needle for your business and brand and elevate your positioning in the marketplace. These tips can help you maximize the value of an analyst meeting and ensure ROI. Are there any tips I’m missing? Let me know on Twitter at @chrisharihar.